Mountain Waters Scenic Byway - Western North Carolina Vacation Cabin Rentals - Nantahala N.C. Macon County. 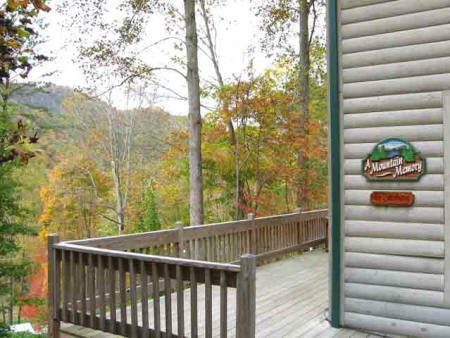 Vacation Cabin for rent close to Nantahala River Gorge and Nantahala White Water Rafting. Western North Carolina vacation rentals near or on Lake Nantahala. WNC vacation homes and cabins for rent. NC Vacation log homes for rent. Cabin rentals on the Nantahala river. Cabin rentals near the Great Smoky, Smokey Mountains National Park and Cherokee, Bryson City NC. Beginning in Highlands, this 61 miles nationally-recognized byway winds through southern Appalachian hardwood forests, by numerous waterfalls and lakes and through two river gorges. Traveling from Highlands to Almond the Mountain Waters Scenic Byway follows U.S. 64, old U.S. 64, SR 1310 (Wayah Road), and U.S. 19. The last miles of this drive travels through the Nantahala National Forest ending at the Fontana Lake. If you enjoy a scenic drive where you can picnic along the way then this drive is for you. Along the byway you can also enjoy boating, canoeing and rafting, biking, fishing, hiking and swimming. Bring your boat, canoe, or kayak and enjoy a fun-filled day on one of the area lakes or on the Nantahala River. CULLASAJA GORGE: makes up the first 7.5 miles of this byway. Traveling through the beautiful Cullasaja Gorge, the winding road parallels the Cullasaja River and offers spectacular scenic views of the river and the waterfalls of Highlands on U.S. 64. A side road actually allows you to drive behind Bridal Veil Falls, where the thin "veil" of water falls for 120 feet. DRY FALLS: You'll find this 75-foot beauty 2.1 miles west of Highlands on U.S. 64. From the parking area, a short paved trail leads you directly behind the waterfall. CLIFFSIDE LAKE & VAN HOOK GLADE: Cliffside Lake Recreation Area is 4.4 miles west of Highlands and then 1.5 miles off U.S. 64. This area offers camping, picnicking, swimming, fishing and hiking. WAYAH CREEK: West of Franklin, the byway turns right on old U.S. 64, then left on SR 1310. SR 1310 (Wayah Road) parallels much of the 6-mile stream. The creek is a good fishing stream, but most of the streamside is private land and is posted "no trespassing". Along Wayah Creek is the Arrowood Glade Picnic Area. Wayah Crest Picnic Area is at Wayah Gap. WAYAH BALD: A side trip to Wayah Bald is well worthwhile. From Wayah Gap, journey 1.3 miles up gravel Forest Road (FR) 69 and see the Wilson Lick Ranger Station. Built about 1913, Wilson Lick was the first ranger station in the Nantahala National Forest. Continue another 3.2 miles up FR 69 to Wayah Bald. Take the short, paved trail to the historic Wayah Bald Fire Tower. Built by the Civilian Conservation Corps in the 1930's, the tower provides a great view of the southern Appalachian Mountains in Georgia, Tennessee, and both Carolinas. You can picnic nearby at the Wayah Bald Picnic Area. Two long-distance trails, the Appalachian Trail and the Bartram Trail, cross the mountain at the tower. NANTAHALA LAKE: Located about 6 miles west of Wayah Gap, this lake has 29 miles of shoreline and offers fishing and boating. Boat ramps are available. NANTAHALA RIVER: This mountain river offers great trout fishing in its upper and lower reaches. The stretch of river above the powerhouse has excellent catch-and-release fishing from spring until early summer. NANTAHALA RIVER GORGE: The Nantahala River draws many boaters who enjoy whitewater rafting, canoeing, and kayaking. Many businesses along the river offer both guided and unguided raft rentals. Most rafting trips begin from the Nantahala River Launch Site and float down the 8.5-mile whitewater run. About 2.75 miles downriver from this launch site is the Ferebee Memorial Picnic Area, which provides another launch and takeout area. At the lower end of the Nantahala River, a commercial-only takeout and a private boater area are provided. From a wooden walkway, spectators get a thrilling view of the wild ride over the final series of rapids, including Nantahala Falls. Nantahala River outfitters, under Forest Service permit, can help plan trips to fit your skill level and provide any equipment you might need. FONTANA LAKE: This lake offers great Bass and Pike fishing with 11,685 acres of water surface and also provides recreational water activities such as boating, kneeboarding, swimming, and water skiing. Construction of the 480 foot high Fontana Dam, which was completed in 1944 and is the highest Dam east of the Rockies, backed water for 30 miles to make up what is now the Fontana Lake. Numerous boat ramps are available. 'A Mountain Memory' is a quiet, secluded cabin offering two bedrooms, two baths, and easy access to the Nantahala River. This cozy cabin features a rustic decor with pine paneled cathedral ceilings and wood floors. Relax in the hot tub and enjoy the peaceful surroundings on the large deck, complimented by a private picnic area and outside grill. Escape to the Smoky mountains for Nantahala River whitewater rafting, Nantahala River trout fly fishing, mountain biking and hiking, while enjoying all the conveniences of home. This cabin is perfect for a honeymoon or anniversary with its cozy fireplace stove and romantic Jacuzzi in the loft; at the same time the spaciousness of the cabin makes it perfect for a small family. Amenities include all-glass front wall facing the view, a rock faced fireplace stove with gas logs, Washer/Dryer, central Heat/Air, a well equipped kitchen with microwave, coffee maker and dishwasher. Entertainment amenities include a four person hot tub on the deck, a large screen TV with Directv TiVo satellite system, DVD and VCR player. Deck has two comfortable Lafuma recliners, two camping chairs and a charcoal grill. Bring your charcoal. Hope you join us in the mountains. Which is it? Smoky or Smokey? We spell it both ways on this web site. So, if you're searching for honeymoon, anniversary or family vacation rental accommodations and log homes, cabins and cottages for rent in the "Smokey" mountains, you'll be sure to find us. Both are common spellings. But if you want to be correct about it, spell it the way the National Park Service does — the Great Smoky Mountains. Smokey the Bear, on the other hand, spells his name the other way. And if you're wondering about "Smokeys", "Smokys" or "Smokies," they're all correct. If you searched for Ashville NC, you're not alone. Asheville North Carolina may be the only city name that is not spelled "Ashville". Tail of the Dragon and Cherohala Skyway NC and TN Motorcycle excursion roads. The Tail of the Dragon at Deals Gap, with 318 curves in 11 miles, is America ’s number one motorcycle and sports car road. The nearby Cherohala Skyway is quickly becoming number two with its remote 60 miles of scenic mountain highway. The area also has other roads less traveled, but just as exciting. Come and discover them all. This North Carolina Vacation Rental Cabin is near Nantahala River White Water Rafting, Nantahala Outdoor Center, Lake Nantahala and Nantahala River trout fly fishing, USFS Tsali Recreation Area Mountain Bike Trails, Appalachian Trail hiking, Joyce Kilmer Memorial Forest, Lake Fontana and Fontana Dam, Great Smoky Mountains National Park, Cades Cove, Great Smoky Mountains Railroad Excursions Train, Cherokee Indian Reserve, Cherokee's Harrah Casino. for a great selection of Mountain Real Estate. Vacation homes for rent in North Carolina. Vacation homes for rent by owner. Vacation cabin rentals on the nantahala river. Vacation house rentals. Romantic vacation cabin with Jacuzzi for rent. Honeymoon vacation cabin with Jacuzzi for rent. Vacation cabin rentals with hot tub. Water lakefront vacation home for rent in Georgia. Vacation cabin rentals with hottub. North Carolina vacation house rentals, North Carolina travel, north carolina tourism, north carolina vacation, asheville north carolina, ashville north carolina, boone north carolina, cherokee north carolina , blowing rock north carolina, franklin north carolina, brevard north carolina. whitewater rafting in north carolina, tennessee whitewater rafting, nantahala white water rafting, nantahala river kayak, nantahala rafting, nantahala national park, ocoee river rafting, white water rafting, nantahala outdoor center, nantahala national forest, nantahala river lodging, nanthala, nantehala, nantahale, nantala, great smoky mountains cabin rentals, cabin smoky mountains. mountain vacations of north carolina, smokey mountain vacations, north carolina mountain vacations. georgia mountain vacations, smoky mountain vacations. nanthala, nantehala, nantahale, nantala. Gatlinburg cabins, gatlinburg cabin rentals, pigeon forge cabins and gatlinburg mountain cabin rentals. Consulting Mechanical Engineer Atlanta GA. Design, Innovation, Inventions. Georgia Institute of Technology, GT GA Tech, Georgia Tech.